The U-PLEX Proinflam Combo 1 (hu) measures a combination of human cytokine assays that are involved in inflammation and immune system regulation. These assays can detect secreted biomarkers in serum and plasma where over- or under-expression may indicate a shift in biological equilibrium. This combo also includes assays for many of the Th1/Th2 pathway biomarkers. The U-PLEX Proinflam Combo 1 (hu) measures biomarkers that are implicated in a number of disorders, including rheumatoid arthritis, Alzheimer’s disease, asthma, atherosclerosis, allergies, systemic lupus erythematosus, obesity, cancer, depression, multiple sclerosis, diabetes, psoriasis, and Crohn’s disease. The U-PLEX platform combines high sensitivity, wide linear dynamic range, a read-time of less than two minutes, and the flexibility to create your own personalized multiplex assays. 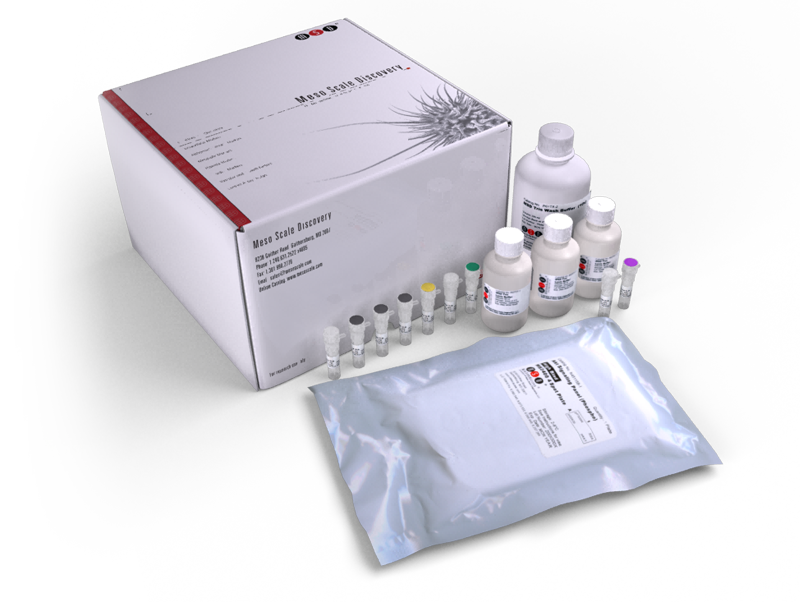 This all-inclusive pack includes U-PLEX plates, Linkers, recombinant calibrators, analyte specific biotiylated capture antibodies and SULFO-TAG conjugated detection antibodies, assay and antibody diluents, Stop Solution, and Read Buffer T. This assay pack may be used for the analysis of all or any combination of IFN-gamma, IL-1β, IL-2, IL-4, IL-6, IL-8 (CXCL8), IL-10, IL-12 p70, IL-13, and TNF-α biomarkers in cell culture supernatants, serum, and plasma.